Fan Dying Of Cancer At His “Last Rave” Reminds Us All Why We Do this. Something really special & powerful was communicated on Facebook/Instagram yesterday and I think it’s important to note it no matter your age or your scene. 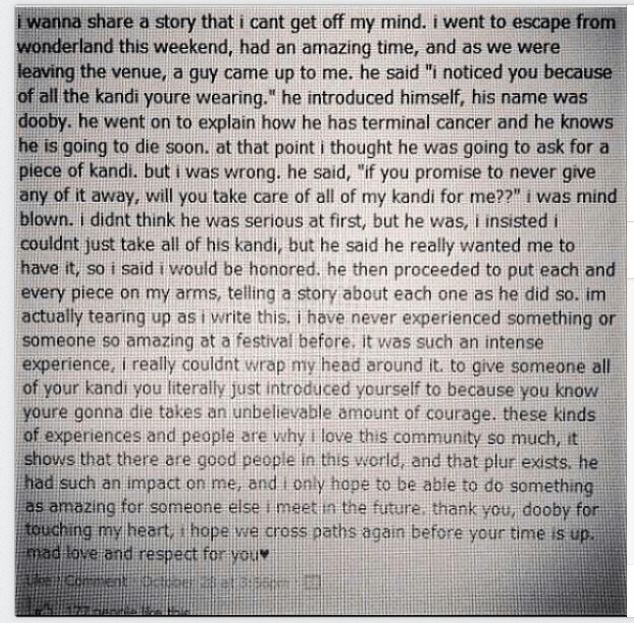 A club kid with terminal cancer who “knew he was going to die soon” decided to hit up Escape From Wonderland, Insomniac’s SoCal Fall Fest that went down last weekend as a last party (for all he knew). He walked up to a random other attendee and asked, and I’m going to quote again, because this is important: “if you promise to never give any of it away, will you take all of my kandi for me? (Instagram of it for the disbelievers: http://instagram.com/p/gA69n5jvmx) The kandi was exchanged after the second attendee emotionally accepted. This entry was posted in News/Lolz and tagged Escape From Wonderland, Insomniac. Bookmark the permalink. ← Happy Halloween! And Hunter S. Thompson Thursday!